If the street is a canvas, spoilt by the taggers but enhanced by artists, what place is there for the accidental? In the Rue de Chantilly, a flash of sunlight catches my eye. This lightning glint, an accident of angles and directions, leads my eyes towards a spherical, spiky object attached to a drainpipe. The object is clearly positioned there to prevent invaders, a modern-day equivilent of the hidden spikes that protected medieval castles. Opportunistic thieves will not attempt to shin up this drainpipe to the first-floor window-ledge, whilst escaping robbers will have to find another means of exiting the building in a hurry. Beyond the intrinsic purpose of the object though, or perhaps because of it, the item takes on another significance. Such protective features are not rare in Paris, but this one is different due to its size and aesthetic qualities. My instant reaction is to think how much it reminds me of the "B of the Bang", Thomas Heatherwick's monumental but ill-fated art installation in Manchester, England. Sanctioned street art there has come to signify danger as several spikes have come loose and threaten to impale passers-by. The installation will soon be dismantled and packed away and the city council have demanded compensation from the team of artists. Looked at from different angles though, the prickly entity in this street also brings to mind a Sputnik or space satellite, or perhaps even a virus, blown-up to terrifying proportions. The object is curiously attractive yet full of sinister significance. It attracts and repels at the same time, contrasting interestingly with its surroundings but with just one intention - to injure. On the Rue Saint Sebastien, another chance discovery. Here the creation is one of decomposition and dampness, of hidden messages and drowned voices. 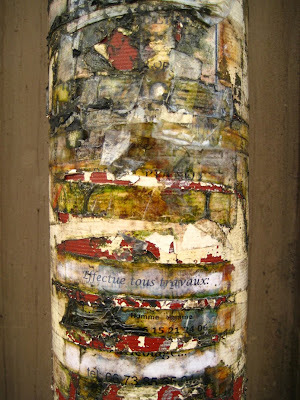 A crimson drainpipe running down a building has provided a smooth surface for promotional messages and offers of services, but time and the weather has chewed up the paper and turned into papier maché. Streaks of clean crimson shine through, but fractions of messages resist. Someone can 'Effectue tous travaux' whilst another is looking for 'Homme Femme'. Call 06.73.85.... for what service? A ghostly 'Piano' can be tuned or bought or perhaps even offered for lessons. If this modern day totem pole were a deliberate creation it would be impossible to recreate the installation. Here the blends of colours, the texture of the putrefying paper and the veracity of the messages add up to something unique. This is not the thought process of one individual, but a collection of tiny voices becoming liquid. The pole, a system of defence in the Rue de Chantilly, becomes here a representation of transmogrification and the ephemeral nature of existence. The city is a canvas for artists or vandals, but the city can also be an accidental artist itself. This is the kind of post I think only you can do... and so well! You have the eye of an artist. Adam, you have a great eye for art-- WONDERFUL post! C'est une éclairage particulier qui attire l'oeil, comme tu dis, un éclat soudain qui "donne l'envie" pour quelque chose qu'on côtoie sans le voir d'ordinaire. En Chine, il y a des grilles de protection même au 15 ème d'un immeuble de 18 étages ! Les invaders sont capables de cambrioler en venant du toit n'importe où. Mon mari a signalé à la mairie un dispositif qui faisait ressembler une clôture d'immeuble collectif dans un endroit passant au mur de Berlin < le système de barbelé a été enlevé immédiatement ! Les dessus de murs anciens recouverts de tessons de bouteille peuvent ête beaux aussi, dans le soleil ! "Compensation from the team of artist", heh. There's someone named Craig (or so he claims) in Melbourne who leaves signs proposing unlikely rendezvous with him. Brilliant post, this one. One that speaks to my artist's mind. Oh how I like these two finds!